Well, hey sweet friends! I’ve been one busy girl and I’ve been keeping a teensy little surprise under my hat. I have a crazy wonderful announcement coming up and I’ll be back to share a little bit about it in the coming days. In the meantime, today is Day of Giving Friday which means that one of you readers who leaves a comment, gets to win this card. 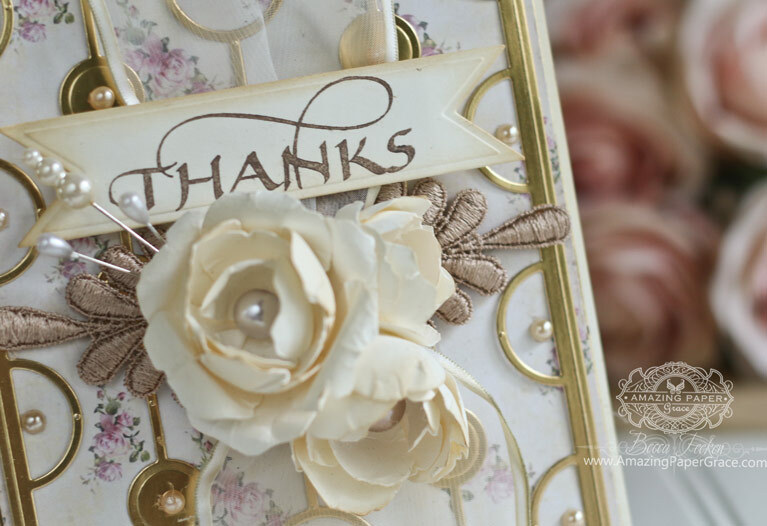 My card today is a thank you card using with my favorite Thanks from Quietfire Design and my favorite to make flowers using Spellbinders Contour Layered Blooms – you can see a no fail way to make the flowers HERE. This is a relatively simple card. I started out with a 5 x 7 card based and layered in some gold mats. For the background I’m using a digital paper from a sweet friend Iralajima who sells on Etsy. Overtop I layered Spellbinders Vertical Chain and then placed this lace motif from my stash and it seemed like the perfect place :-) I made three flowers using my Spoon Flower Technique, and varied the size, one medium, one small and one tiny. Last but not least I pulled the banner from Spellbinders Decorative Swallowtail Tags to stamp my sentiment. For new readers, every Friday it’s my pleasure to give away a card. The card goes to a randomly picked reader (worldwide) who leaves a comment in our conversation. Want to know more about Day of Giving, here’s a link to my FAQ’s just check out #11. You can check to see if your name is on the list of winners HERE.! For your comment: What piece of advice would you give your younger self? Just popped in to say what a beautiful card the flowers are so pretty too! Such a wonderful card here Becca, really beautiful work as usual. Sooo exited to hear what your great news are, and now I´m just sooo curious ha ha ha. HOW PRETTY BECCA! Different from your normal cards. I LOOOOVE IT! Hi Becca, wow this card is gorgeous. Ooh can’t wait for your announcement! Your education and goals are important and should come before any man. What a pretty card! I can always use ideas for thank-you cards, I send so many. This is just lovely. As for advice I’d tell my younger self, I’d tell myself not to take myself so seriously.My younger self had too much intensity. Beautiful card Becca, I must make those flowers I have the die. What advice would I give my younger self…..have more patience and less procrastination. Really a lovely card Becca! Adore the color choice and the stamped image is just perfect on this design. A beautiful elegant card. I must learn how to do your spoon flowers. I saw the link bur don’t have time right now to view it. Good morning Becca, thankyou for a beautiful card it’s gorgeous!!! I can feel your excitement!!! What I would tell my younger self? Live everyday as if it’s your last and do it today because tomorrow never comes!!! Having already having been lucky enough to win one of your beautiful cards, I am sure the lucky person will be overjoyed. A truly beautiful card Becca , looking forward to your news. My advice to my younger self would don’t give in to the pain and stay mobile . Hi Becca. gorgeous card. Love your spoon flowers and having watched your video, realise how easy they are to make. If I was my younger self I would realize that everything my mother told me about my boyfriends and my girlfriends was true. In my early married years I would have kept a journal of what I did each day like cut the grass, paint the house, dig the gardens and things like that because my husband tells me he always did it! On tenterhooks to hear your news! up the ladder a bit wouldn’t hurt . I would tell my younger self, that you are ok just the way you are, believe in yourself, and love everyone/everything in your life! Breathe. The world keeps turning, and the things you need to heal from, you will. You are stronger than you know, and fear doesn’t need to rule your choices. People are better than you’ve experienced, and you will be healthy, I promise. Becca – love that paper, I still have some! A beautiful card – thank you! When this came in, there was only one response but my hubbie had to use the computer, so I am a little late. 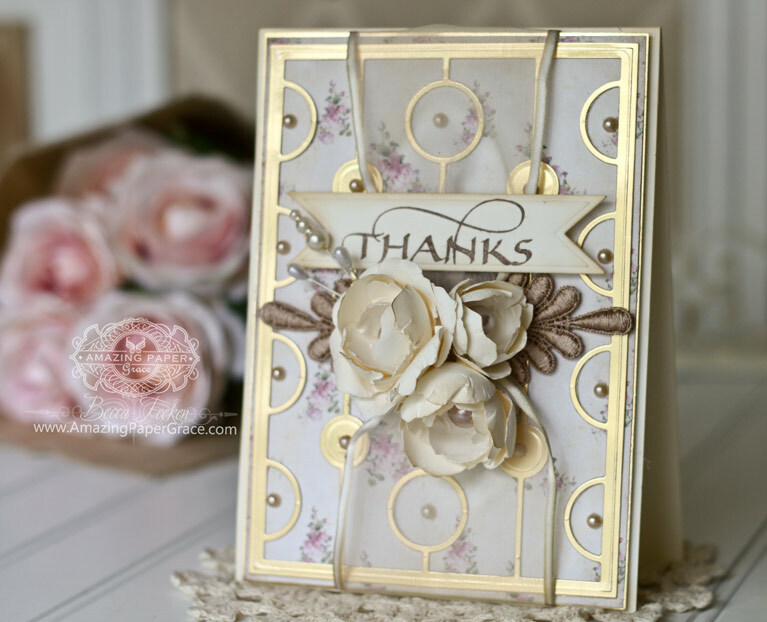 This is one beautiful card and never imagined how this die could be used in this way! Love the flowers! Am very anxious to hear your good news. My advice to my younger self – Do everything the exact same I did as my life has turned out very well. One thing I would change is to less shy in my younger life. It took me a while to come out of my shell, so be more outgoing. 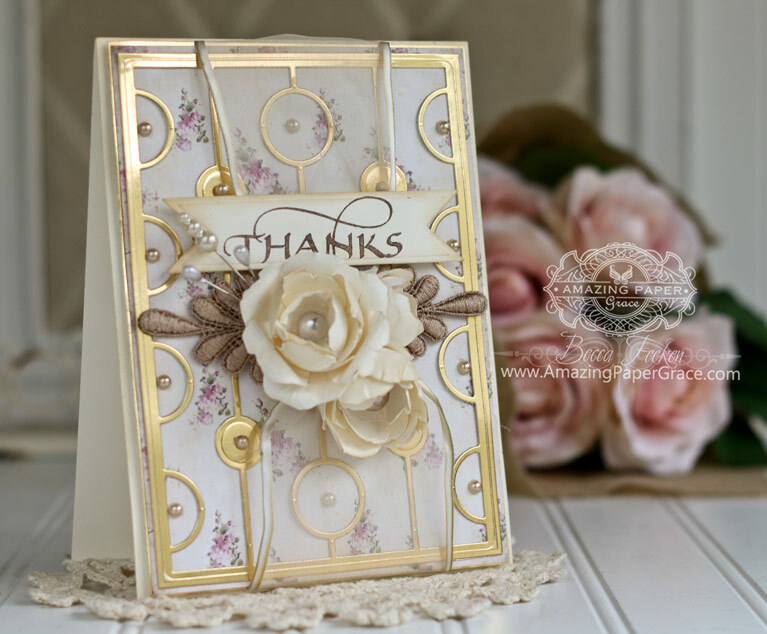 Don’t know how you keep doing such lovely cards Becca…stunning work! Thank you for sharing your talent with us – it is so inspiring!!! What a beautiful card Becca. Love the subtle tones and the gorgeous sentiment. I would tell my younger me to value myself and not let myself be taken advantage of. Another exquisite card Becca, I love it! My advice to my younger self? Live life to the full and enjoy every precious moment – life’s too short to worry about things you can’t change. What a pretty card today. Looking forward to hearing your news. My advice to my younger self would be “don’t worry so much”. A stunning and gorgeous card, Becca! A lovely card, as always even though your cards are always uniquely different. The flowers are beautiful and even though I’ve seen the video, I’m going to watch it again. There’s always something new to learn that will help me be a better crafter. I would tell my younger self to pray more, not to sweat the small things and always be thankful. Hi Becca, This card is stunning, and I love the flowers. Advice to my younger self would be to make the ‘most’ of the short time I had with my two Sons, also to make the ‘most’ of the time I had with my Mum and Dad, and to ask them questions that only they could answer for me, oh how I wish that I could go back in time !! I’m looking forward to hearing your news, it’s exciting !! Hya Becca love this sooo much that i have ordered the die!!!! The advice i would give to my younger self would be ….to be true to yourself and live the life YOU want !! Not what is expected of you by other people ….dont conform to other peoples standards but set your own . This is indeed a work of art and definitely deserves to be framed Becca. Stunning. I love it. It’s simple and elegant and as always I love the gold. What a gorgeous card! I’m glad you had it in a frame because your cards really are works of art! To my younger self I would say, do not listen to all the Nay sayers. Go for your dream with all your heart and never let anyone crush your desired goal. Continue to be your own unique self and do what you love! Life is for Living, enjoy every moment, especially with your children as they grow up in a blink of an eye. Becca I am so excited for you and can not think of anyone else I would rather watch. Unfortunately I am in Australia and not sure if I can get the programme anywhere. We do have foxtell but i have not seen it there. I wish you well and praise God for the beautiful talent you have. Whatever you do is full of one word only I think fits to describe………Beauty!!!!!! I makes my heart sing!!!!! !